When a king’s pinky grows stinky, it is up to a smallish boy and a smallish pea to come up with a GIANT plan to save the kingdom—a fractured fairy tale from William Joyce and Moonbot Studios, the masterminds who brought you The Fantastic Flying Books of Mr. Morris Lessmore. You might think you know the story of Jack and the Beanstalk, but you might want to think again. In this fairy tale with a twist, it hasn’t rained in days and the king has dictated that something must be done—his royal pinky is getting stinky! With a little magic from a wizard, young Jack, paired with his pea pod pal, will find a GIANT reason as to why there’s no water left in the kingdom...and prove that size doesn’t prevent anyone from doing something BIG. Moonbot Studios is a secret, zero-gravity colony in Shreveport, Louisiana, inhabited by interstellar beings. Their mission is to create imaginative books, films, apps, games, and entertainment in this—and any other—dimension. Come see at MoonbotStudios.com! Kenny Callicutt is a tallish artist. He honed his illustration skills at Virginia Commonwealth University and, since 2012, has been drawing and magicking at Moonbot Studios. 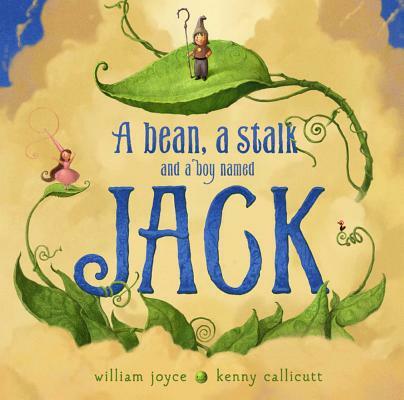 A Bean, a Stalk, and a Boy Named Jack is his picture book debut.